“Tiger’’ Ted Lowry, the only fighter to go the 10-round distance twice against future heavyweight champion Rocky Marciano and who nearly handed Marciano the only loss of his career, stood tall as a professional fighter and as a man. Mr. Lowry served his country during World War II with the 555th “Triple Nickel’’ Parachute Infantry Battalion, an all-black airborne unit of the US Army. And he was known to talk about the indignity he suffered, riding in the back of a US military bus in which German prisoners were allowed to sit in front. Mr. Lowry, who took youth off the streets in Norwalk, Conn., and into the ring as a mentor and trainer through the Police Athletic League, received numerous honors for his community service and boxing career that began in 1939 and ended in 1955. He died of heart failure June 14 at Norwalk Hospital. The longtime Norwalk resident was 90. A New England light heavyweight and heavyweight champion who fought out of New Bedford in the early 1940s, Mr. Lowry established the High-Low Forms and Foundations construction company after his retirement from boxing. Until last year, Mr. Lowry, and his wife of 46 years, Alice (Johnson), were bus monitors for the Colytown Elementary School in Westport, Conn.
A 2008 inductee to the Connecticut Boxing Hall of Fame, Mr. Lowry was honored on his 80th birthday, Oct. 27, 1999, with “Ted Lowry Day’’ in Norwalk. 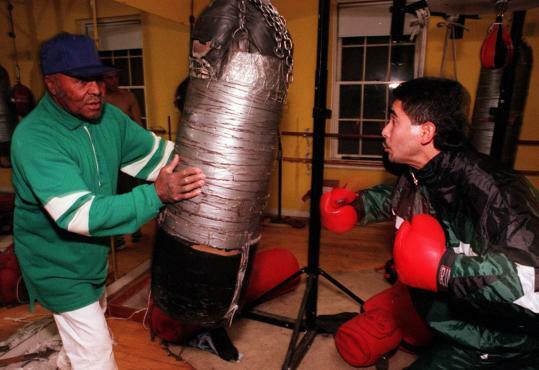 “Ted taught a lot of us to become boxers, some of whom were in the streets drinking, drugging, and getting into trouble,’’ recalled Larry Johnson, a former welterweight fighter who started in Mr. Lowry’s boxing program in 1979 and is now chief executive officer of the Character Under Construction in Norwalk, a youth enrichment program. “He always invited me to the gym no matter what was taking place in my life or what I thought of myself. He always accepted me and told me I was a champion. Robert Mladinich, a former prizefighter who has written for Ring Magazine and the website sweetscience.com, said Mr. Lowry started to believe in himself as a fighter after going up against the great heavyweight champion Joe Louis while serving with the US Army in Louisiana. In 1949 in Providence, Mr. Lowry fought Marciano for the first time and lost by a decision, but according to newspaper accounts, many in the crowd felt Mr. Lowry should have won the bout. The two fought again in 1950, and Marciano dominated, but could not KO Mr. Lowry. Marciano went on to win all of his 49 fights, 43 by knockout. “Rocky had great respect for him, and when you consider Rocky’s record, what Ted did against him was remarkable,’’ Marciano said. Mr. Lowry, who had 67 wins, 67 losses (including a stellar performance against light heavyweight great Archie Moore), and 10 draws, grew up in New Haven and moved to Portland, Maine, at age 13. A four-sport athlete at Portland High, he lived with other fledgling fighters in New Bedford, then went back to New Haven after military service. “Ted was willing to go anywhere and fight anybody on short notice for short pay to support his family,’’ said Mladinich. “When he approached me about typing his memoir in 1996, I knew nothing of his past,’’ Napolitano said. In addition to his wife, Alice, and son, Wayne, Mr. Lowry leaves three other sons, T. Kevin of Alexandria, Va., Charles Roy of Hayward, Calif., and Wayne Miggins of Fort Washington, Md. ; and his first wife, Marjorie Fowler of New Haven. Another son, Kenneth of New Haven, who designed the artwork for his father’s book, died last year. A funeral service has been held for Mr. Lowry. Burial was at Willowbrook Cemetery in Westport.